When he signed the bill into law last month, Gov. J.B. Pritzker said the Gun Dealer Licensing Act was about stopping straw buyers. "The reason for it is to deter straw purchases so that we can prevent someone from buying a gun for someone else who is not legally allowed to own a gun," he said at the signing ceremony in Chicago. Jim Barnard, 69, couldn’t see a way to afford the cost of compliance with the new law. After more than four decades of operation, the owner of Fishman’s Sporting Goods in Girard had to make a tough decision. "I’m just going to retire, I guess," he said. "I hope that I can live off of what I’ve saved over the years." He made the decision to close his business in late January. Mick Moore made the same decision for Walnut Creek Shooters Supply in Brownstown after seeing not only the cost of the license and the camera system, but also the uncertainty additional regulations and more fees. "It’s just not worth it," he said. "I’ve fought it and fought it but I’m just not up to the fight much longer." Just five miles south of Moore's shop is Bear Arms. John Washburn has owned Bear Arms since 2013. Although he doesn't plan to close his doors, he said the future for his business is bleak. "We’ll just have to wait and see, but there’s probably a chance that I’m just going to get out of it," he said. "It’s because of the requirements." Neither of the law’s sponsors would respond to comment on the closings. In Vandalia, Justin Arndt is working to comply with the requirements of the new law. He said the cost of video surveillance for his gun dealership and the cost to maintain that video for 90 days was significant. "Between the security on the video surveillance, the state fee, and the electronic [record-keeping requirement], I could incur an additional $5,000 just to keep my doors open," he said. "I don’t know how many of us are going to be able to withstand this." Todd Vandermyde, executive director of Federal Firearms Licensees of Illinois, said the requirements aren’t about stopping crime, rather regulating gun shops out of business. 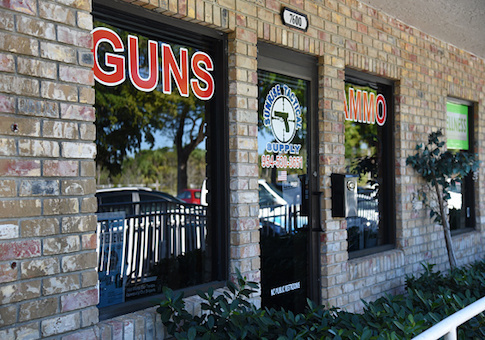 "You make it sound like this is a reasonable request but if a small gun shop has to put in a $10,000 surveillance system on top of potentially $3,000 in licenses, how do you expect them to stay in business," he said. "This isn’t about safety. This isn’t about regulation." He said he’d heard of a number of other licensed online dealers closing their businesses as well. Large companies that have multiple stores across the state are only required to pay the new annual fee for 27 locations, which would put the corporations at the $40,000 cap, the rest essentially amounting to what Vandermyde called a tax break. He and others are weighing court challenges to the new law. This entry was posted in Issues and tagged 2nd Amendment, Guns, Regulation. Bookmark the permalink.